‘Riot City: Protest and Rebellion in the Capital’ with Clive Bloom. 7pm, Wednesday 5th September. Entry: £3, redeemable against any purchase. 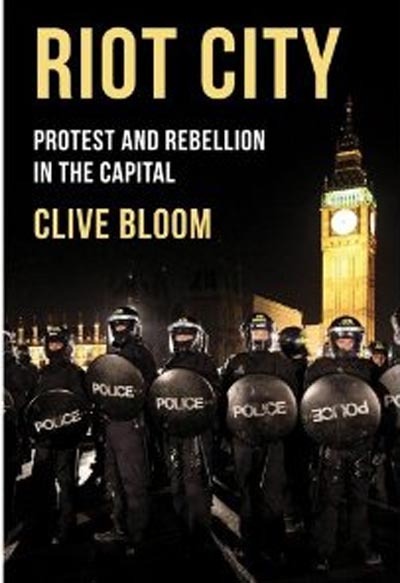 Clive Bloom discusses the past, present, and future of unrest and rebellion in London, as explored in his latest book. Since 2000, London has seen unprecedented levels of unrest. Its streets have become the battleground for a host of new demands and new ideological standpoints; its occupants, protesters and authority alike have had to invent new tactics to cope with the pressure of street politics and advances in social media. ‘Riot City’ deals in detail with the story behind the capital’s unrest from the perspective of protesters, police and government. Using a range of sources, from security briefings to reportage, Clive Bloom provides an analysis of the modern protest movement, placing it in the context of a long history of rebellion. From the student protests to the August riots, Bloom deftly draws parallels between London’s shocking events and reveals, more disturbingly, how many lessons can still be learned from our riotous past. This event is part of the London’s Burning series at Housmans. Clive Bloom is Emeritus Professor of English and American studies at Middlesex University. A respected broadcaster, he is also the author of ‘Violent London: 2000 years of Riots, Rebels and Revolts’ (Palgrave Macmillan,2003; 2010), Literature Politics and Intellectual Crisis in Britain Today (Palgrave Macmillan, 2000), Cult Fiction (Palgrave Macmillan 1996) and many other titles. This entry was posted on 23 August, 2012 in homepage, Uncategorized and tagged Clive Bloom, English riots, Housmans Bookshop, London riots, Riot City, street fighting man. Bookmark the permalink.